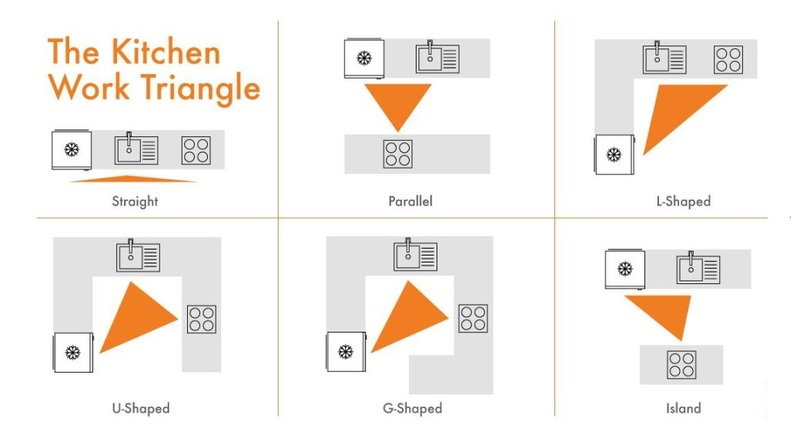 Can The Work Triangle Improve Your Kitchen Design? Most people have never heard of the work triangle but many designers still believe it can help create the perfect kitchen space in any home. It was first used around the 1940’s and was a scientific attempt to help cooks who were in small kitchens utilise their space as economically as possible. The triangle essential involves the cooking area, your utensils and the food storage and how these connect together. For example, where you have your cooker in relation to the fridge and the sink are important in designing your kitchen in the first place. You don’t want them to be too far apart if you are cooking lots of meals. Keeping them connected means you don’t waste your time jumping from one part of the kitchen to another and everything is within easy reach. Of course, if you have a large kitchen, you may want things spread out. After all, you’re not cooking for lots of tables every night of the week like a professional chef. The triangle is as much about keeping things (or people) out of the way as it is anything else. Let’s say that you want to have an island in your kitchen. The rules would dictate that this needs to be out of the way of triangle because it represents an obstacle. The thing about modern home kitchens is that they are also social hubs. You are likely to have someone sitting doing work on their computer at the kitchen table while you’re preparing the dinner. Or you may have kids and your other half hanging around talking while the Sunday lunch is being cooking away. In larger kitchens you could even have a TV or entertaining area where people are gathered. The key to the triangle is that nothing should interrupt you ‘cooking flow’. What you don’t want is to be scooting past people and in between furniture as you do all your preparation and make your culinary creation. The minimisation of traffic within the cooking triangle helps to plan for all these eventualities so that you can work more efficiently. That’s why you’ll most often find the sink near to the hob so that when you need to drain pots of veg you can do so relatively speedily. Preparation areas are normally closer to storage areas like the fridge or the spice rack. Your kitchen may well already have taken into account the work triangle. If you are looking for a whole new design, you probably want to move things about a little. That means you’ll need to re-evaluate the triangle as any major transformation might actually make it more difficult to get the cooking done. Is the fridge too far away from the preparation area? Is that new kitchen island or breakfast bar taking up too much space and hampering your cooking? Are there obstructions in the way that you could do without? The truth is that your design may well look great on the surface but once you really start using this area again you could begin to see the flaws in your planning. This is why it is always important to get some expert advice when you are designing a new kitchen. While you want it to look fabulous, you also need to be able to operate effectively – as kitchen designers we’re here to help with that so that you avoid any common mistakes.